Hi! Meet our mandolin player, Jenee! She is the reigning CMA touring musician of the year, plays with the likes of Blake Shelton, Martina McBride, Steven Tyler and other popular recording artists. She has recorded on major label records as well. You can't go wrong with a mandolin track played by Jenee and it ADDS SO MUCH to a recording! Jenee playing mandolin tracks on Mike Anderson's He Will Set You Free and Mama Taught Me About Jesus. Both songs © 2016 Mike Anderson, produced by Bill Watson. Posted for demonstration of production values only. All other use is a violation of U.S. and International copyright law. 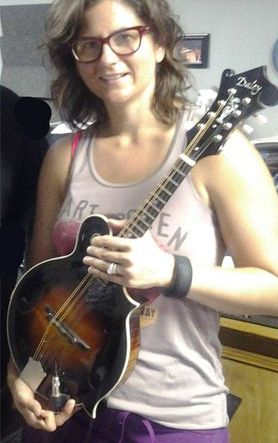 It's so EZ to add a mandolin track, played by Jenee, a Nashville professional, session-quality player, to your home or studio recording project! 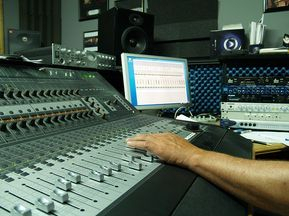 Four beats of click track or your drummer saying "1-2-3-4" upfront is helpful for the player to start precisely at the start of your song, but not necessary. If you have a click track throughout the song please mix it panned hard left and everything else panned hard right so we can adjust volume. Or you can send your stereo mix as well as the mono click separately. Lead vocal is very helpful but it works best set just enough to be audible. For $95 you'll receive one part with pads where there are vocals or other instruments filling. You'll get fills in any holes throughout the song as well as a solo if there's a section left open for solo mandolin. Two songs both needing mando? Get both for $170. Three songs or more? Just $75 each!